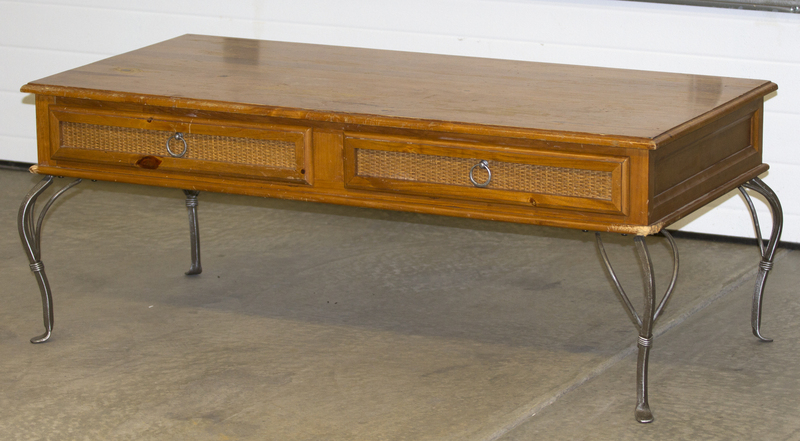 This upholstered bench was a beat up, dinged up coffee table that was given to one of my daughters. 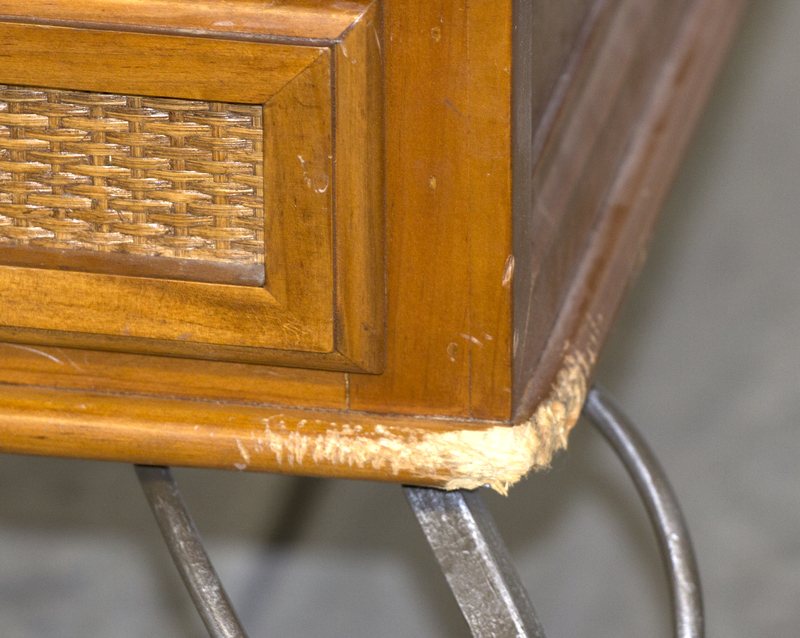 A puppy had chewed up the bottom trim and it had scratches all over it. We looked at it and decided to see if we could make a bench. It did have some interesting metal legs after all. 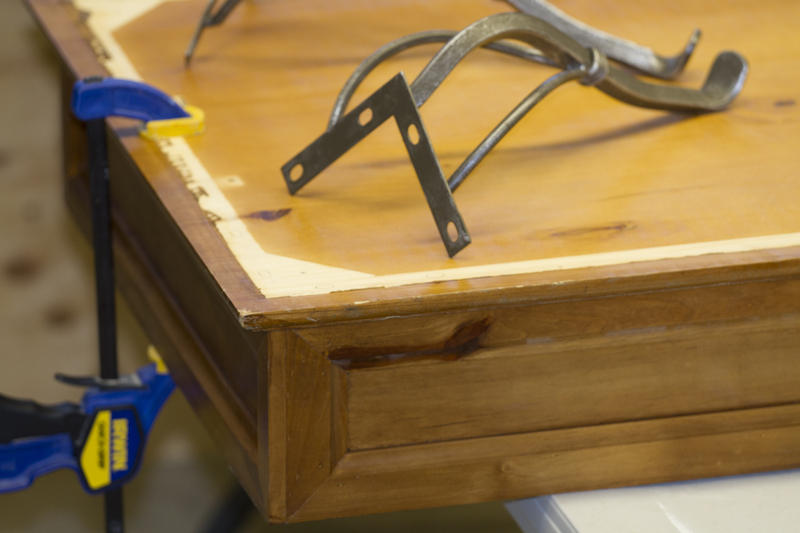 We took out the drawers, unfastened the metal legs, and took the top and the bottom chewed up trim off. We weren’t sure if the pieces would come apart easily since they were glued in addition to being screwed together. Then we dry fit the top to use as the future bottom, marking and drilling holes for assembly later. The chewed up trim was set aside since we would not be using it. Then a piece of plywood was cut to the size of the top. Holes were drilled so when the cushion is compressed, sat on, the air could escape. Foam was spray glued to the plywood and then wrapped in batting. We upholstered the plywood seat and added piping around the bottom. The drawer fronts, body and new bottom that was the top were painted with Graphite chalk paint, distressed, then clear wax and finally dark wax applied. 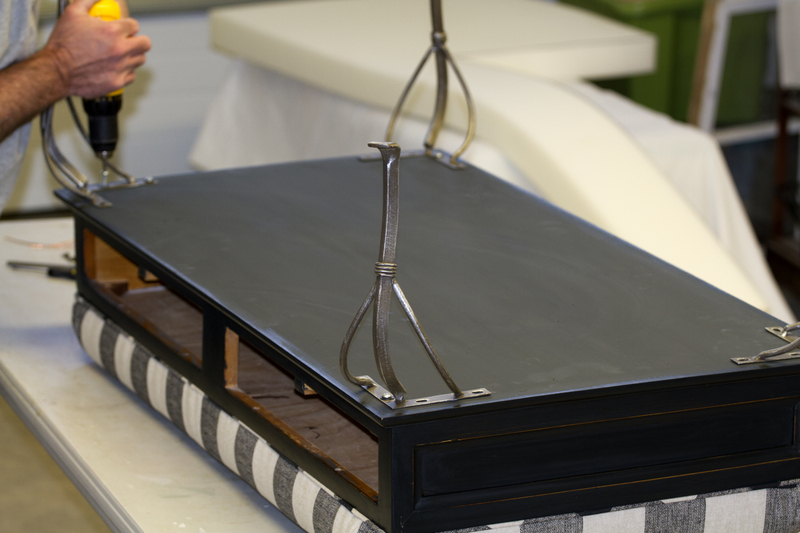 The upholstered top was placed on the top of the body and we used the original hardware to connect it that fastened the top previously. 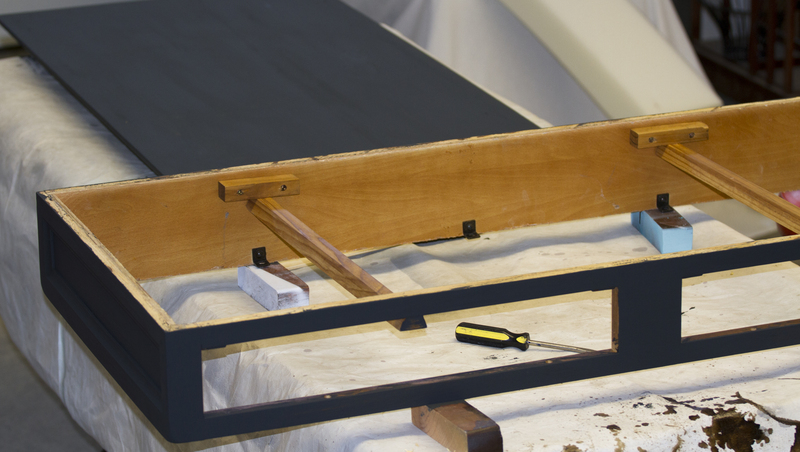 Then placed the bottom (formerly the top) on the body lining up the holes we drilled before painting it. The legs were installed which was what also held the new bottom on. We put in the drawers and it was finished. It looks better than it’s previously chewed up condition and is comfortable to sit on. A new use for something that may have been thrown away. Keep creating! 14 May	This entry was published on May 14, 2014 at 8:21 pm. 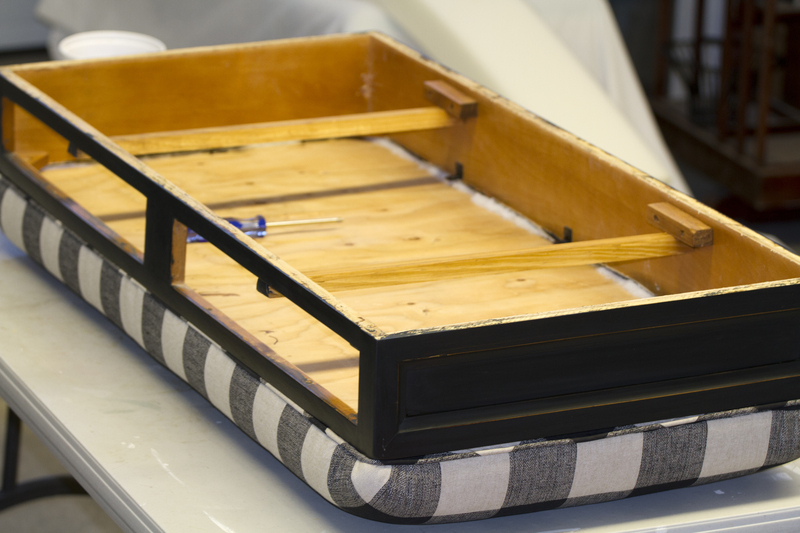 It’s filed under DIY, Re-purpose, Re-purpose Gallery, Tutorials and tagged bench, coffee table, DIY, repurpose, upcycle, upholstery. Bookmark the permalink. Follow any comments here with the RSS feed for this post. This looks awesome! What a transformation!! i have an old hope chest that I wanted to put a cushion on top of because the top is all scratched up. Can that be done the same way? It probably could be. Can you send a photo? 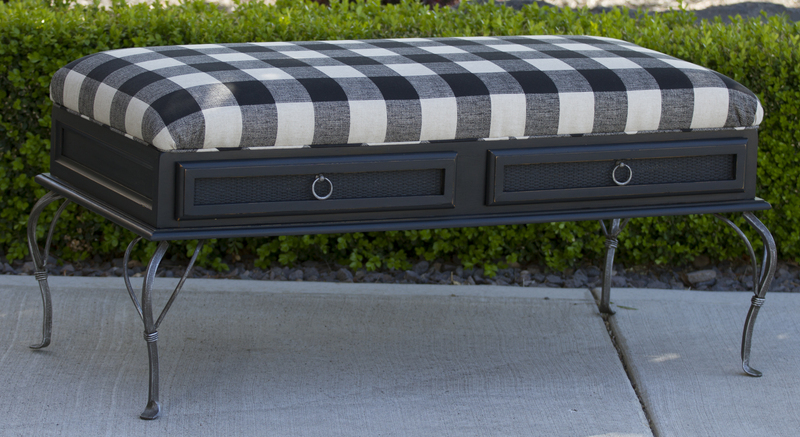 you did a beautiful job making this into a bench; love the black with the fabric. Please share where you got the buffalo check fabric. Thank you. I purchased the fabric at Hancock Fabrics. They may have it available online if you don’t have a store near you.